The Cedar Lee Theatre (2163 Lee Rd., Cleveland Hts.) and IFC Films presents the new film MATCH opening exclusively at the Cedar Lee Theatre starting Friday, January 30th playing at 1:40, 4:00, 7:25 and 9:40 daily through February 5th. Patrick Stewart gives a captivating performance in this witty, emotionally gripping adaptation of director Stephen Belber’s own Tony Award-nominated play of the same name. 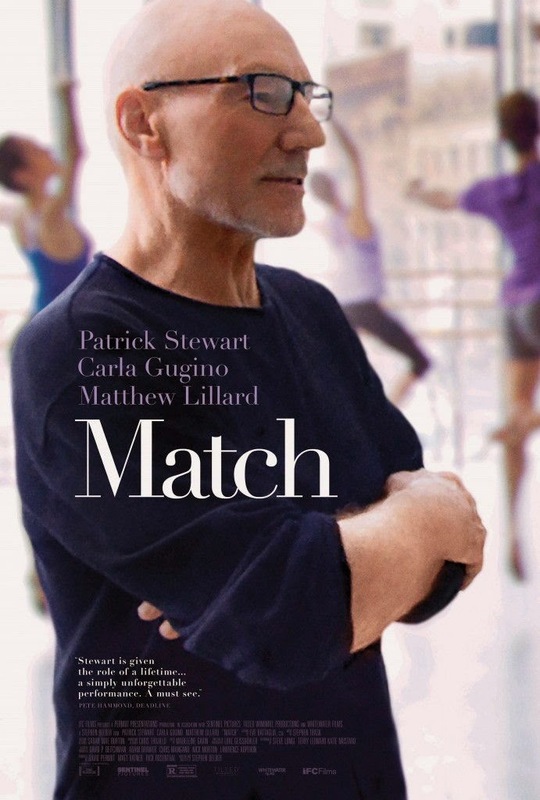 Stewart stars as Tobi, an eccentric, pot-smoking Manhattan ballet instructor whose quiet life is interrupted by the arrival of a young couple (Carla Gugino & Matthew Lillard) from Seattle, presumably there to interview him about his colorful life as a dancer in the 1960s. As Tobi spins salacious tales from his former career, an ulterior motive for the couple’s visit emerges, forcing the trio to confront a secret that may connect them all. Driven by Stewart’s tour-de-force performance, MATCH moves masterfully between razor-sharp comic banter and heartrending poignancy. Following the 4:00 PM screening on Saturday, January 31st there will be an in-person Q&A with the following guests: Mathew Lillard who plays Mike Davis in the film, Stephen Belber (writer/director) and Matt Ratner (producer). Tickets to this special showing and Q&A will be $20 and benefit the Center for Arts-Inspired Learning. Tickets for all other showings of the film are $9 for Adults after 6 PM and $6.50 for Adults before 6 PM, Seniors are $6 all day. Tickets can be purchased at the theatre box offices or clevelandcinemas.com in advance or the day of the screening. Programs are available for PreK-12 Grade students, are aligned core curriculum, and can be customized for curricular needs. Programs are available during school, after-school, and out-of-school time.